Whiplash is a problem that results mostly from car accidents. Approximately 3,000,000 people annually sustain whiplash injuries in the US, which leads to damage of the ligaments and joints in the neck. The surrounding muscles can also experience damage and spasms as well. 15% of those who sustain whiplash end up with chronic neck pain that lasts for years. Since chronic neck pain often responds well to radiofrequency ablation, a recent study looked at RF procedures for those who had chronic pain from whiplash. In the study, approximately 60 participants were evaluated and the results were presented at the World Congress of Pain meeting. The participants had gone through at least six months of conservative treatment which may have consisted of physical therapy, medications, chiropractic treatment and those sorts of therapies. Radiofrequency ablation worked exceptionally well in over 65% of the study group. The patients typically experienced pain relief for over six months on average. Along with seeing significant pain reduction, patients experienced functional improvements and there was a significant return to work percentage. 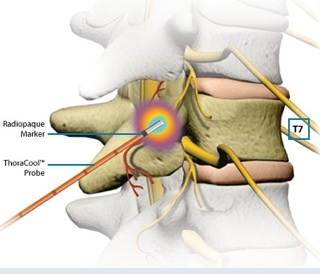 It is no secret that cervical radiofrequency ablation works well for chronic neck pain due to arthritis of the cervical facet joints. Now we have evidence showing those who end up with chronic pain after a whiplash injury can also see excellent results with radiofrequency ablation. Along with RFA for neck pain due to whiplash, additional treatments that may help include physical therapy Las Vegas, chiropractic manipulations, TENS units, trigger point injections, facet blocks and spinal decompression therapy. Call a Las Vegas Chiropractor, pain doctor, or PT clinic to get started on your neck pain treatment today!